1. 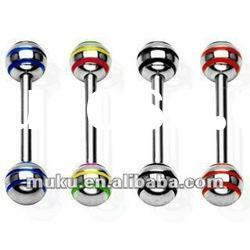 Fashionable and popular design body piercing jewelry Free high resolution ratio picture 2. 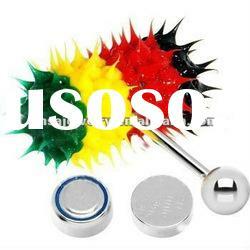 Material:316L stainless steel,UV& acrylic,silver and gold plated, titanium titanium plated ,silicon,wood and other material products are also available3. High polished and very bright4. Nickle&lead free,no virus,no infection and non-allergy,non-corrosive,non-deformation 5. Preferential factory price with high quality guarantee Made by craftsman with innovational design and strict QC process and quality guaranteed 1 year6. Certificate : ISO 9001:2000 , ISO14001:2004 7. 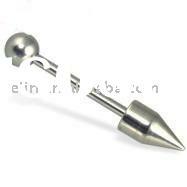 Many styles and Various colours with different gauges&sizes waiting for you to chose8. Our products can be customized to sample9. Sample and trial order are welcome10.Orders can be negotiated11.Different transportation is available12.Fast delivery and short delivery time13.EMS ,DHL,FEDEX,TNT ,UPSand others for you to choose Our company is located in the largest international commodities center of Southeast Asia YiwuCity.We are specialised in designing ,producing,selling,and exporting body piercing jewelry .such as tongue ring ,navel ring,nose ring,labret ring,eyebrow ring,ear ring,ear tunnel,ear plug,bracelet,necklace,pendant,tattoo.And each product includes different sizes/colors/material/styles.Our material include acrylic,316L and surgical stainless steel,titanium,titanium plated,goldplated,silverplated,silicone,resin,rhinestone,wood,glass,and so on.We have rich experience .Our products have entered into the world market. 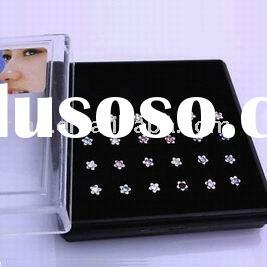 Welcome to our website www.zelinjewelry.com.cn where we offer high quality products and sincerely service . If you have any question, you can contact me by alibaba:cn220145153 or send email to me. My tel:8618267093059 , 86-0579-85360102 .And I'm pleased to share with you .